For the reconstruction of the Durlacher Karlburg and for the city itself many Baugüter were needed after its destruction in 1689 in the Palatinate War of Succession. The so-called Floßgraben was created in 1699 for the transport of stone from local quarries. With the growth of established 1,715 new residential town of Karlsruhe fallen asleep for a few decades transport was the stronger resumed after the mid-18th century. After previous planning began in 1767 with the expansion of the waterway into the new residence. With day laborers, craftsmen and soldiers we closed the distance between the Pfinz, the Floßgraben, the channels and the old Landgraben at Gottesaue lock up in Karlsruhe. From 1770 the building materials could be transported by smaller vessels, which were loaded with up to six cubic meters of stones and towed, ie drawn from the bank by humans or animals, were. The expansion was not easy for the workers. The sources that were encountered during excavation, were repeatedly delayed the completion. A problem that we experienced in the late 1990s again in the construction of tunnels Grötzinger. 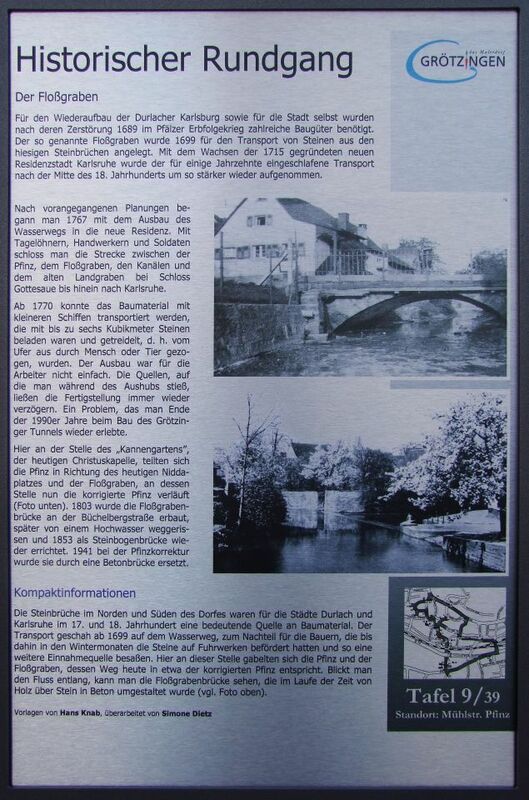 Here in the place of "Can Garden", today's Christ Chapel, the Pfinz divided in the direction of today's Nidda space and Floßgraben, now in its place the corrected Pfinz runs (photo below). 1803, the raft grave bridge was built on the Büchelberg road, later swept away by a flood and built in 1853 as a stone arch bridge again. 1941 at the Pfinzkorrektur it was replaced by a concrete bridge.